A built-in rotissierie and dedicated burner is the main special feature of this brushed stainless steel three-burner Affinity 3400-S from Ducane. Front-mounted controls leave the end tables open for tools and supplies, or lift the hinged cover on the side burner to keep soups and sauces cooking while you work. You give up a little cooking space to accommodate the rotissierie, but still wind up with a 36,000 BTU output over the 343 square inches of main grilling surface. The grill inserts are quarter-inch stainless steel wire grids, light and durable compared to cast iron, but not quite so good at distributing and holding heat -- enameled steel plates above the burner tubes spread the flame and even out the temperature over the cooking grid. Both the side burner and the rotissierie are rated at 12,000 BTUs apiece, so this grill is definitely not underpowered, but consider whether those features are the ones you'll really use. The grill itself is warrantied for five years, with a two year warranty on rotissierie and burners -- that's pretty much industry standard. Heat and smoke will degrade the rotissierie, even if you don't use it regularly. 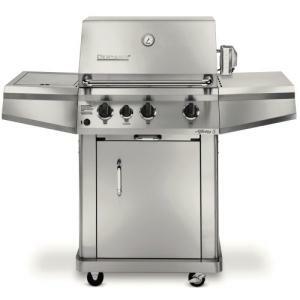 Two of the most useful perks are standard equipment with this grill -- reliable electronic ignition and a built-in cooking thermometer in the lid. A warming rack above the grilling surface gives 134 square inches of additional slow cooking area.